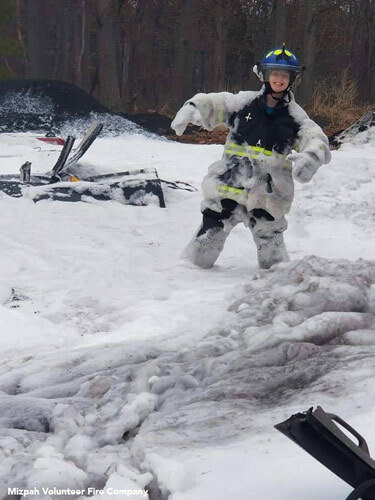 HAMILTON TWP., N.J. (WPVI) -- A South Jersey fire company is mourning the loss of one of their own who was killed in a single-car crash while responding to a call in Hamilton Township, Atlantic County on Christmas morning. Police say 21-year-old Natalie Dempsey of Mays Landing was driving a black 2001 Honda Accord, when she lost control, and drove off the roadway, striking a guardrail. Officers from the Township of Hamilton Police Department responded to the accident scene on Landis Avenue, just west of Estelle Avenue, around 6:20 a.m. Tuesday. Dempsey was pronounced dead at the scene. She was the vehicle's only occupant. Dempsey was the Vice President of the Mizpah Volunteer Fire Company. Mizpah, along with the Mays Landing Fire Department and Hamilton Rescue Squad, assisted at the scene. Chief Jay Davenport says once they put out the fire Dempsey was responding to, they got another call for the car crash. "We stopped in the truck to assist and we walked up on the car and realized what it was," Davenport said. No one knows how Dempsey lost control of her vehicle. Chief Davenport says it happened just a few hundred yards from the fire station. He nor anyone at the station was able to hold back the tears while talking about the star of the Mizpah Volunteer Fire Company. "Just a beautiful person, a smile that could light up a room. Great individual," Chief Davenport said. A childhood picture of Natalie Dempsey and two flowers now sit on top of a twisted and mangled guard rail. "It's going to be hard, but we know she's watching us and will be in whatever calls we go on," Eriana Davenport of the Mizpah Volunteer Fire Company said. Around 6:30 p.m., Christmas night, a vigil was held for Dempsey at the station, complete with the familiar noise of fire trucks. Firefighters say Dempsey loved the sound of loud sirens. But they say she loved nothing more than being able to suit up at her locker and respond to a call to help. The fire company wants Dempsey's family to know they how much they loved and cared for the 21-year-old aspiring police officer. "We're just sorry for what's going on and we'll do whatever it takes," Chief Davenport said. "We just want to let them know we're here for them. They're family, we're all family. This isn't just a fire company, this is one big family," Eriana Davenport said. Chief Davenport said Dempsey had been a volunteer firefighter for three years and attended the police academy over the summer. "Please keep her family in your prayers. We will keep you all updated on any funeral arrangements. This will be a funeral with full honors due to it being a line of duty passing," the Mizpah Volunteer Fire Company posted to its Facebook page. It concluded by saying, "Natalie Dempsey, thank you for your service; we'll take it from here."